“Good Fast Cheap. Pick two” is a well-known and much-quoted maxim. It succinctly communicates the value you can provide to customers, as well as the relationship between what your customer wants and what they are willing to give up to get it. But I don’t think it’s entirely correct. Certainly, it’s easy to remember but following it too closely could steer entrepreneurs wrong and may result in lost sales. The reason? I believe the “2:1 ratio” (i.e. Good plus Fast but not Cheap) is not the diametrically opposed model we have come to expect. 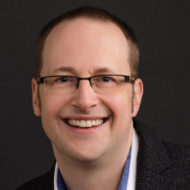 By choosing two and giving up one, entrepreneurs are making assumptions about their prospects and customers, which is what will ultimately drive prospects away. Let’s use a simple diagram to illustrate. We’ll start with the current and widely accepted model, below. Along the outer triangle are the customer’s “must have” elements. 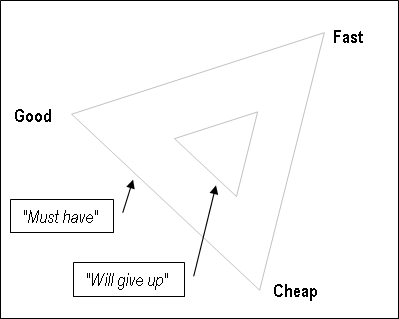 The inner triangle is the element that the customer is willing to give up. 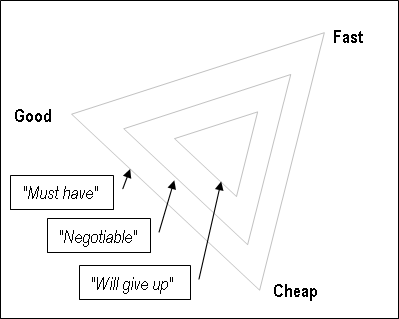 So the current thinking is: a customer who wants something Cheap and Fast will give up Good in order to get it. I’ve illustrated that below. 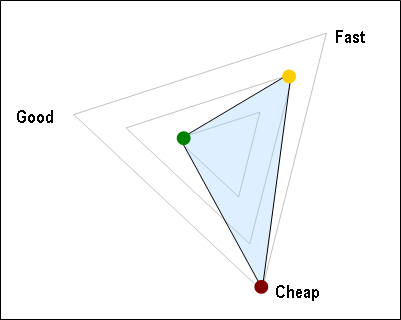 The “must-have” elements of Cheap and Fast are shown in red on the outer triangle; the “don’t need” element of Good is shown in green on the inner triangle. 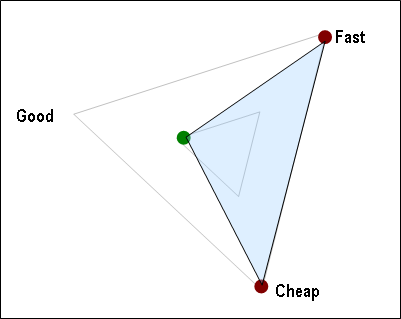 The problem with this model is that a customer might not be so firm on their desire for Cheap and Fast that they will give up Good to get it. (Likewise, a customer might not be so firm on Good and Fast that they’ll give up Cheap to get it, or a customer might not be so firm on Good and Cheap that they’ll give up Fast to get it). customers want two elements and will give up one… but there is a often little more room for negotiation than we have come to believe. Rather than a 2:1 diametrically opposed position, what if we considered something else: a model in which the customer has a primary “must-have” element, an element they’re willing to give up, and something in between – an element that has some room for negotiation. Consider of your perspective as a buyer for a moment and I think you’ll discover that this makes sense. 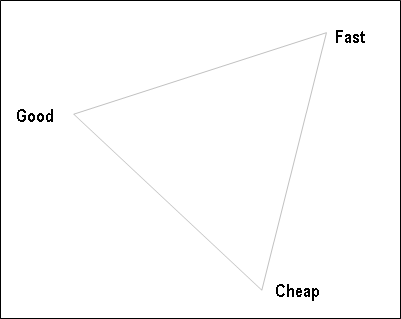 There is usually an element that you really, really need: Either Good or Fast or Cheap. And, there is usually an element that you are willing to give up: Again, either Good or Fast or Cheap. And somewhere in the middle is something that you’re willing to negotiate a little, perhaps relenting slightly on your “must have” element or accepting more of the element you don’t care that much about. Let’s look at an example of a customer that we may have once thought of as wanting Fast and Cheap but not Good. In our conversations with them, we may have heard them point out how important Cheap is and how unimportant Good is… and we have assumed that Fast is therefore very important to them, too… thus we have thought of them as the Fast and Cheap but not Good customer. With this new model, and a little more listening in our conversation with the prospect, we discover that they really want the product or service to be Cheap and they don’t care how Good it is. But we also discover that Fast isn’t as much of a non-negotiable as we may have thought. In fact, there is some room for negotiation. As a result, we might give them some speed-of-delivery options. They can pay slightly more to get the product sooner, or they can pay slightly more for a higher quality product. Ultimately, we can offer these customized add-ons to them because we know what their negotiable element is. Let’s look at another example. Once, we thought of a customer who wanted a product or service as Good and Fast but understood that it would not be Cheap. Perhaps we hear them say something like “I need it tomorrow” and “I’m willing to pay whatever it takes”. Therefore, we assume that they want it to be Good. With this new model, and a little more listening in our conversation with the prospect, we discover that (along with what we already know about them wanting a Fast delivery at any price) that their definition of “Good” is negotiable and maybe we can offer them something faster by cutting back on how thorough our service is or offer them something slightly more expensive by achieving a level of higher quality. The key is: They can decide and we have the opportunity to earn higher profit through a more customized approach. 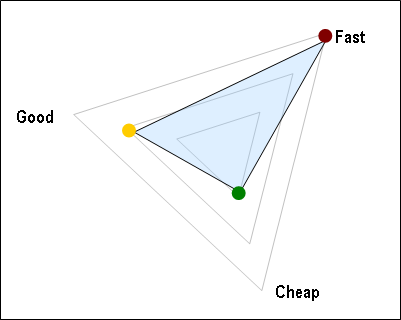 As you can see, Good Fast Cheap is still an important concept, but it’s no longer about picking two at the expense of a third. Rather it’s about finding the must-have element and the “don’t need” element and then engaging in negotiation. I think there are a few reasons that this matters to entrepreneurs and business owners. First, you want to run a profitable business. By finding the negotiable element, you can add value in the areas you do well while you pull back in areas you can’t deliver on as successfully, thus creating a high value product while minimizing your weaknesses. Second, you can deliver exactly what a customer wants. If a customer wants something cheap and they don’t care how good it is, that doesn’t mean they want it really fast. There may be room for negotiation. You can deliver various levels of quality at various levels of speed. This creates some customizable options, giving the customer a sense of control over the uniqueness of their purchase. Third, you can capture more sales from contacts who might not have otherwise bought from you. If a prospect feels that your “Good and Fast but not Cheap” model wasn’t a right fit, they might go somewhere else. But if that same customer felt that you would deliver Good with some flex in the Fast and Cheap elements, you open the door further for them to explore doing business with you. “Good Fast Cheap. Pick two” sounds good. But a better model that can lead to more profitable sales is: “Good Fast Cheap. Pick one and negotiate”.